Home » insects » pistol shrimp » sound » The pistol shrimp emits a sound that is louder than a gunshot! The pistol shrimp emits a sound that is louder than a gunshot! The pistol shrimp competes with much larger animals like the Sperm Whale and Beluga Whale for the title of ‘loudest animal in the sea’. Amazing, given that the pistol shrimp is only 1–2 inches (3–5 cm) long. The sound stuns small fish and crabs, allowing the shrimp to move in for the kill. The creatures, also known as snapping shrimps, are native to the warmer waters of the Mediterranean and have only been found swimming off the coast of Britain a handful of times this century. A pair were discovered last week near the mouth of the Helford River in Cornwall by crab fisherman Tim Bailey, 56. They were brought to the Blue Reef Aquarium in Newquay, where staff were forced to separate them to stop them stunning each other. Curator Matt Slater, who collected the creatures from Mr Bailey, said: 'Only a handful of this type of shrimp have ever been recorded in UK waters, although their numbers do appear to be on the rise. 'I started to think they were something special while I was driving back from Falmouth. 'I kept on hearing this cracking noise from the back of the vehicle as if someone was popping bubble wrap. It is distinctive for its disproportionately large claw, (larger than half the shrimp’s body) which does not have pincers at the end. Rather, it has a pistol-like feature made of two parts. A joint allows the “hammer” part to move backward into a cocking position like a gun. When released, it snaps into the other part of the claw, creating a cavitation bubble capable of stunning fish and breaking small glass jars. He said the level of noise made by the shrimps was comparable with that produced by a sperm whale. 'That is 40 tonnes, and this is 2cm,' he added. 'The click of the claw stuns the victim for enough time for them to get on it and kill it - from tiny shrimp to anything planktonic. Douglas Herdson, the information officer at the National Marine Aquarium in Plymouth, said that the creatures are so loud that they can be heard by sailors. 'I have heard of yachtsmen being moored in a bay and not being able to sleep because of the noise these shrimps make,' he said. He added that the species is likely to be seen in UK waters more often as sea temperatures rise. The British pair may have been carried to the UK as larvae by a passing ship. 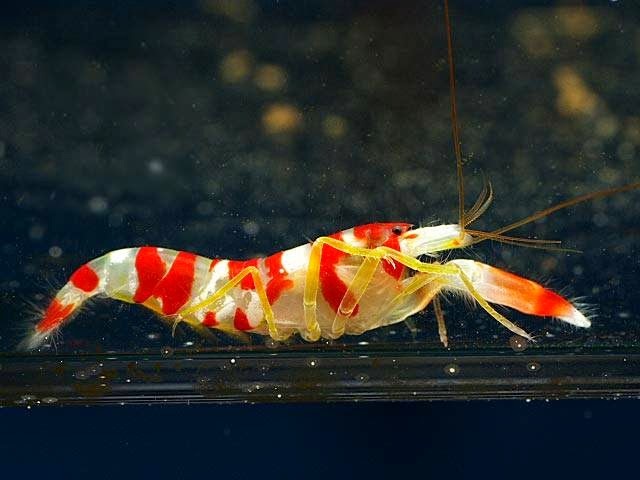 There are around 600 species of pistol shrimp worldwide. Most dig burrows and feed off small crabs and fish. As the bubble extends out from the claw, it reaches speeds up to 60 miles per hour (97 km/h) and releases a sound reaching 218 decibels. The duration of the click is less than 1 millisecond. The snap can also produce sonoluminescence [light] from the collapsing bubble. As it collapses, the cavitation bubble reaches temperatures of over 5,000 K (4,700 °C). In comparison, the surface temperature of the sun is estimated to be around 5,800 K (5,500 °C). The light is not visible to the naked eye. It is likely a by-product of the shock wave. It was the first known instance of an animal producing light by this effect. The snapping is used for hunting, as well as for communication. When feeding, the shrimp usually lies in an obscured spot, such as a burrow. The shrimp then extends its antennae outwards to determine if any fish are passing by. Once it feels movement, the shrimp inches out of its hiding place, pulls back its claw, and releases a “shot” which stuns the prey; the shrimp pulls it into the burrow and feeds.